i think Ella puts her money where her mouth is ,and this will give other local “big shots” a wake up call. 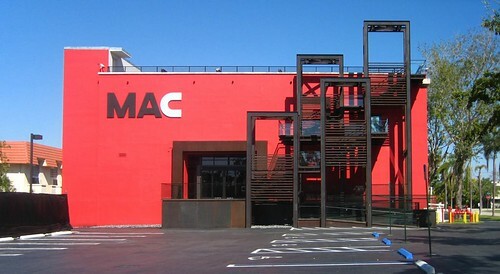 MAM may not be much now, but it could slowly become one of the best museums in the southeast and hopefully the country. we’ll see! MAM does not get the free land on Bicentennial Park and the taxpayer money UNLESS they raise at least $108 Mil privately. Not pledges, but cold hard cash. No more PAC screwups. I understand MAM has raised almost nothing toward the $108 Mil needed. Perhaps they would be better off on a smaller piece of land in Overtown? And perhaps a smaller structure would more fit their budget? I came out in support of Bond Question 8 in 2004, the one that authorized and funded the Museum Park scenario to the tune of $175M. (I stopped following the story, but I believe Resident is correct about having the additional operating expenses in hand, and furthermore, usage of the land itself for museums has to receive approval by public vote.) Museum Park displaced another proposal to turn the land into yet another sports arena, but otherwise, I had hard feelings about getting behind it – I was being asked to help pay for a museum with a curatorial agenda too narrow to support my work as an artist or that of like-minded colleagues. MAC’s curatorial agenda is even narrower, and the merger looks like it’s creating a landscape that’s even more inhospitable to my interests. Thankfully I no longer have to live in it. They just opened a new contemporary art museum up here in Boston, which rents land for $1 per year from a private owner, and covered construction costs with funds raised entirely from private sources, $66M worth. The building is lovely, and it opened late, but only by three months. And if they end up not supporting my work, what the hell, at least I’m not being asked to pay for the privilege. I believe there are really two things you wanted in the “curatorial agenda” of MAM when you lived here: you wanted them to support local artists such as yourself, and you wanted them to put on more shows like this — serious shows of established, traditional artists. Does it occur to you that these two directions are, if not mutually exclusive, then somewhat out of harmony with each other? The ICA is indeed lovely, and enviable. And you share your desire that art museums should be privately funded with Marty Margulies. But really now, the voters voted for this proposal (yes, the way it was presented was broken), and so the $100 mill is sitting there. Now it remains to be seen if the MAM can raise the balance (which I think will ultimately be much higher then $108 million). I now thing they have a shot. The MAM gets a lot of criticism from a small group of people (your like-minded colleagues among them), which I think is more indicative of the need for a second, more traditionally-minded institution. Insofar as I believe fundraising for such an institution would be comparatively easy, I’m surprised it hasn’t happened yet. Alesh, if you look at the programming of the High in Atlanta or the Portland Museum of Art, you can see that those goals aren’t mutually exclusive at all. My lament, though, was that shows like Americans in Paris had nowhere to go in Miami, period. That wasn’t the fault of MAM per se, or any fault of its ambitions. It’s just like the fact that Miami has no autumn color – if you like that kind of thing, you don’t live there. And that’s why you’re not going to see a “second, more traditionally-minded institution.” There’s no will for that to exist. “I will support this museum if I think it will show my work” may sound peculiar, or even selfish, but consider the converse: “Over the last decade we’ve never shown your work, we’ve almost never shown work by your friends, we haven’t often shown the categories of work that you like, either by locals or nationally known artists, and our recent merger indicates that we will do so even less in the future, but we want you to support us on principle anyway.” Does that sound no less peculiar? The thing is, I’m willing to support it on principle up to a point, but beyond that, the relationship becomes abusive. You know that book, He’s Just Not That Into You? There you have it in a nutshell. Your guy isn’t calling you, sure, but not because it’s just been really crazy at the office lately. So yes, the money’s there and it has a shot. At what, though? I see why you might care, and good for you, but why should I? That sounds like getting upset with 7-11 for not selling shiitake mushrooms and ginger sauce: the High has more then ten times as much exhibition space as the MAM! With more exhibition space naturally comes the ability to make more people happy. A show of local art at MAM recently closed. They’ve had painting shows. Given sufficient space and time, they’ll have a show of local painting sooner or later. Yes, if YOU were in charge it would happen sooner or more often. But considering that local painters get pretty decent exposure in local galleries, does it make sense for the MAM, with its limited space, to show them every couple of years? Of course the overwhelming majority of Miamians who care about art think not. Yes, MAM was never into Franklin the painter. But I think it probably cared about Franklin the art lover. Why should you care? Well . . . I don’t really want to get into a conversation with a hypothetical Franklin who stayed in Miami — that’d just be weird. I’ll stipulate that you shouldn’t care. You can watch with disinterested curiosity to see whether the new building gets built, and what happens in it if it does. I personally think there is a need for a traditionally minded art museum. A lot of the “culturally-minded” rich older folks who’ve spent the last 10 years getting MPAC built are probably looking around for something to turn to next, and that may be exactly what they decide to look at. You asked if the goals were mutually exclusive, not if MAM was capable of either of them. Given sufficient space and time, they’ll have a show of local painting sooner or later. I gave it ten years. Look, as an artist, at some point you have to make an intelligent decision about your career, based on evidence, not wishful thinking. But considering that local painters get pretty decent exposure in local galleries, does it make sense for the MAM, with its limited space, to show them every couple of years? Alesh, that’s idiotic. Do you really think that anybody at MAM is saying, “Well, local painters are getting pretty decent exposure in the galleries, so we shouldn’t expend our limited resources to exhibit them?” They build exhibitions around their holdings and their aspirations to contemporaneity. They work with local artists who fall into those two categories. Of course the overwhelming majority of Miamians who care about art think not. And you speak for them, I see. I personally think there is a need for a traditionally minded art museum. So do I. It won’t happen. The values of Art Basel drive the market down there. I had hopes for the Goldman Warehouse, in light of that beautiful Olitski show, but not long afterwards MoCA moved into it and soon it was full of juvenilia by Friends With You. So there’s a need, but no one with the bankroll or the will to fill it. Juvenilia, did you really mean that? Kids loved that show it was well attended and fun. is art not supposed to be fun? sure Miami needs a lot of things but just because we don’t have a good traditional art museum, that the greek government is suing so they can get back their nations treasures, doesn’t mean that we should denny that we need a great contemporary art space. Bicentennial Park should remain green. Miami needs waterfront green space. Every developer eyes public land as an opportunity to get free or low cost land. The Miami Art Museum apparently has little or no permanent collection. Few people support MAM either with money or with art. Perhaps MAM should just move into a renovated Wynwood warehouse? Or two? No one believes they will raise the $108 to $200 Mil needed to get the free waterfront land. And in actuality, the waterfront park land should stay open and green.